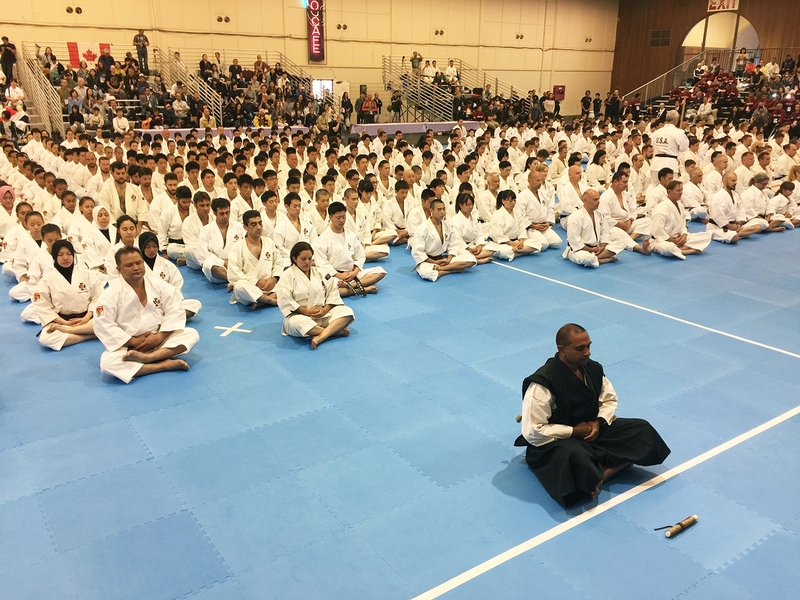 Established in the small town of Tadotsu in Kagawa, Japan, Shorinji Kempo has been practiced by over 1.8 million people worldwide and has spread to over 40 countries. These statistics only come to life when you attend a World taikai. A walk among the participants is illuminating as you read the badges on the left arm of their dogi… Canada, USA, Garmany, France, Indonesia, Spain, Monaco, Cambodia and Russia to name some. 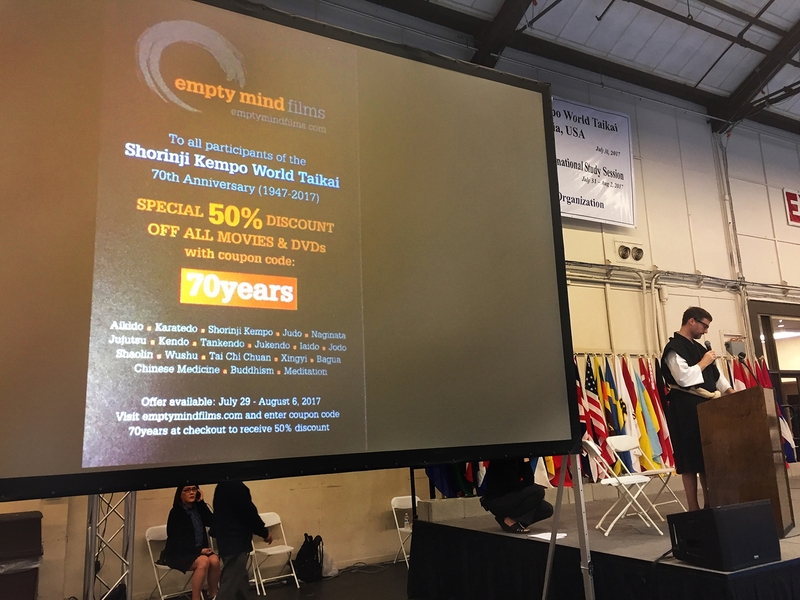 Our filming was made possible by the efforts of Hiroshi Onaka sensei from Seattle, who was our guide during this wonderful event and the kindness shown by World Shorinji Kempo Organization. 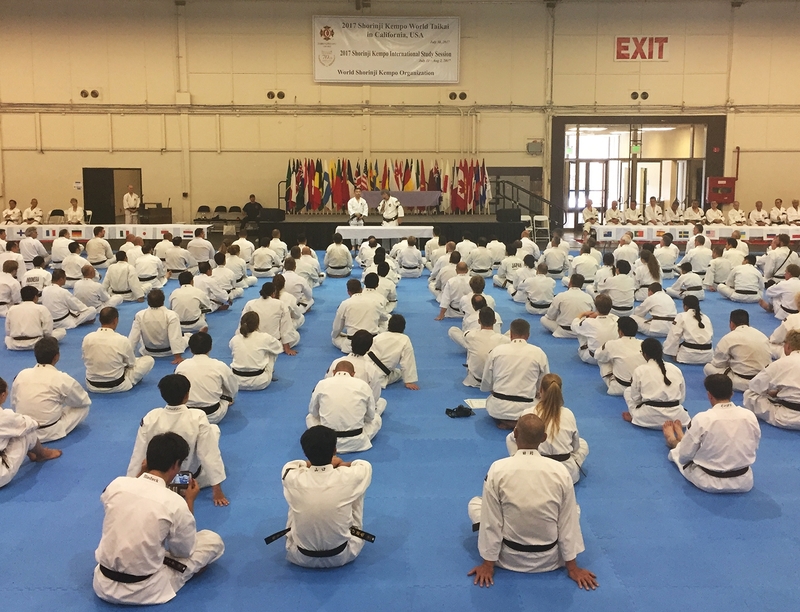 The Taikai (Opening day Sunday). After the line up and formal greetings and speeches, a traditional Chinkon gyo was held (meditation and reciting of the oath and creed). See photo below. 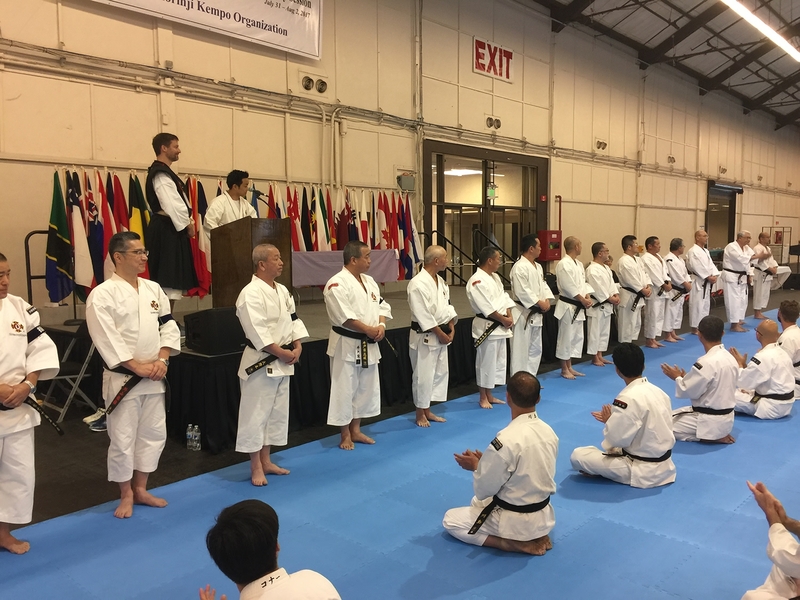 The line up of kenshi which stretched the length of the San Mateo event hall then parted in the center to allow a superb embu or demonstration of kumite led by Ashii sensei in traditonal uniform. 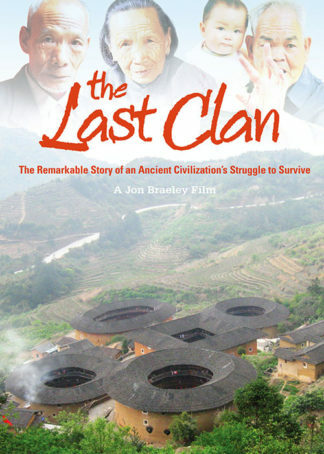 The rest of the day was composed of group and individual competitions. Groups were organized by country across six courts in the main hall. One interesting aspect was the pairing of man and wife teams and parent and child teams. Day One (Study Session Monday). Monday morning began again with the traditional Chinkon gyo. The instructors were lined up to greet the kenshi and introductions were made with Gassho… see photo below. 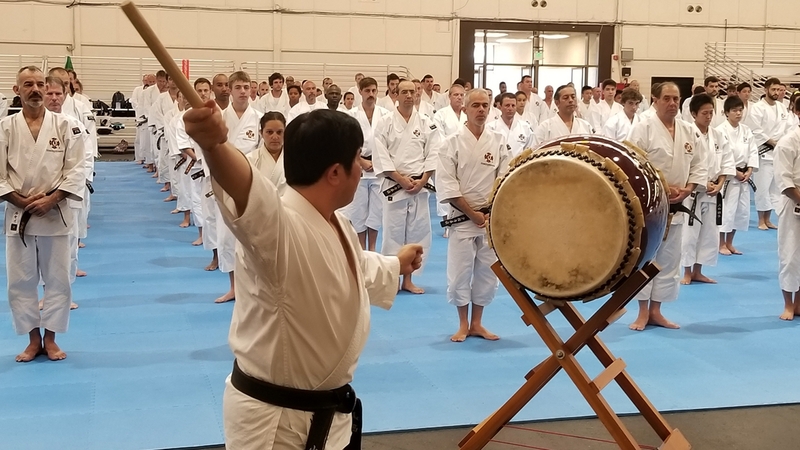 This was followed by an extensive warm up and basics (kihon) in one large group and it was clear the kenshi which filled the huge auditorium were excited to get training. 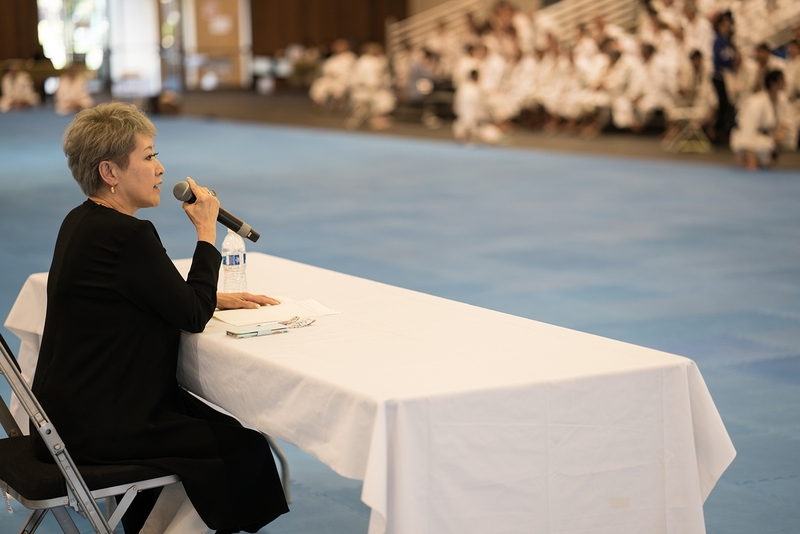 A lecture followed group practice by the WSKO president, Yuuki So titled “Be the bridge… making the world better one person at a time.” See the photo below. 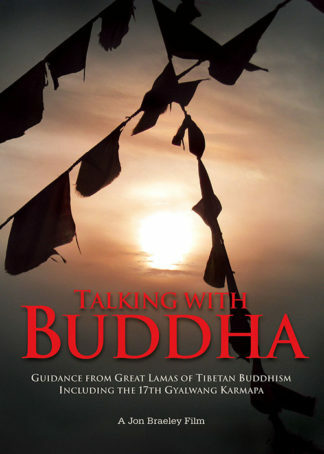 The afternoon was composed of two periods of practice, mainly single technique with explanations. This was broken up by a discussion session composed of teams of 5 to 8 people. Judges will select certain discussions for a formal presentation the next day. Day Two (Study Session Tuesday). After the Chinkon gyo and large group warm up, there followed a period of practice, mainly single technique split into 5th dan or higher and a 4th dan group and down to 2nd and 3rd groups and so on. In this way technique is aimed at the same level so everyone could understand. This was very well orchestrated with each sensei using a translator in each group. After mid-morning practice, Kawashima sensei delivered a lecture titled: “The essence of Budo”, referring to the Tokuhon manual and study session manual as reference material. Sensei Kawashima is seen instructing below in the photo. The afternoon was a more intense training session of four main groups led by Arai sensei and Aosaka sensei. 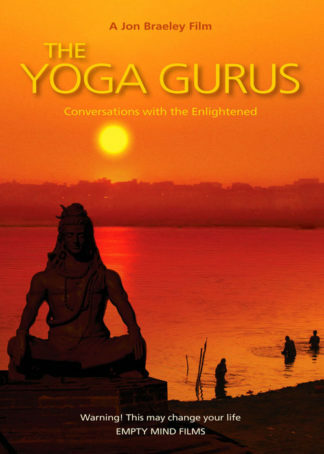 We were very impressed by the high level of tuition… the depth at which the technique was explained. The afternoon practice was mainly Juho technique of defense against grabs and holds. These practice sessions would have a theme as the main techniques, such as morote okuri gote, where an attacker is grabbing your wrist and the defender turns over the attackers own arm or wrist into a pin or throws the opponent. On Tuesday evening a barbecue party was held outside on the event center grounds. This was very much in keeping with the Shorinji Kempo concept of “we are all family”, with president Yuuki So taking the time to chat to kenshi and pose for photographs. It was a fun affair with soft-drinks and beer and great grilled food. Possibly the highlight was Hiroshi Aosaka sensei dancing with a colorful female partner to the live band the ‘Beasts’. The final day began in similar style to the first day’s study session with group warm up and group practice… with all the kenshi on the mats. 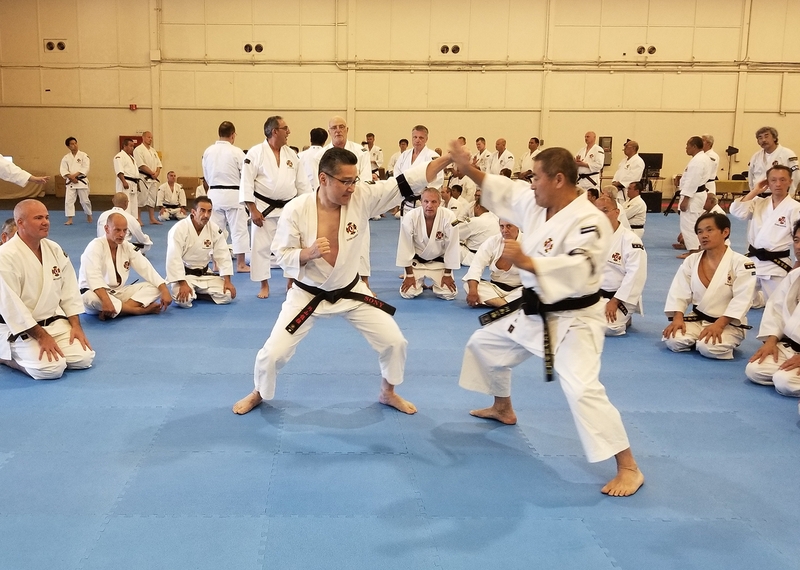 The single technique practice was mainly Goho with blocks, counter punches and kicks with an emphasis on Ma-ai or keeping correct distance. Instead of a lunch break, the presentation of new grade ranking certificates was held, with president Yuuki So presiding. 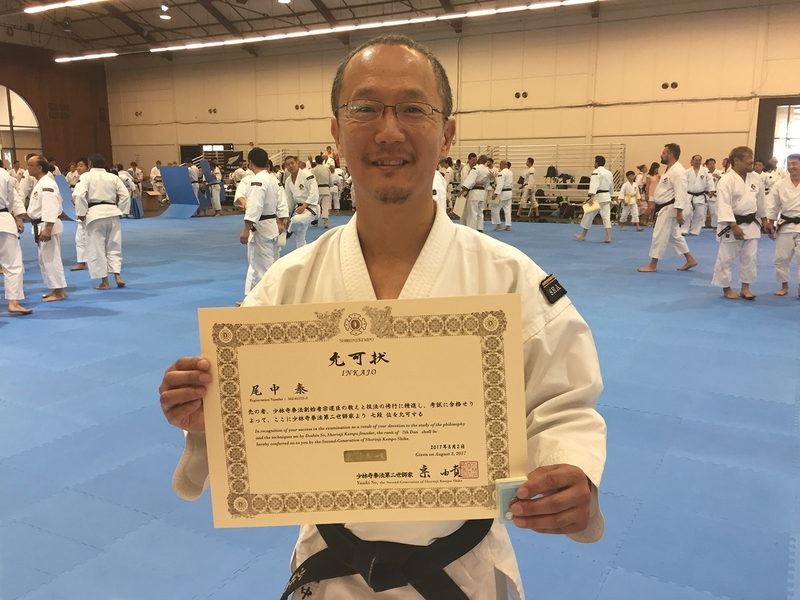 Below is Hiroshi Onaka sensei proudly displaying his 7th dan certificate. 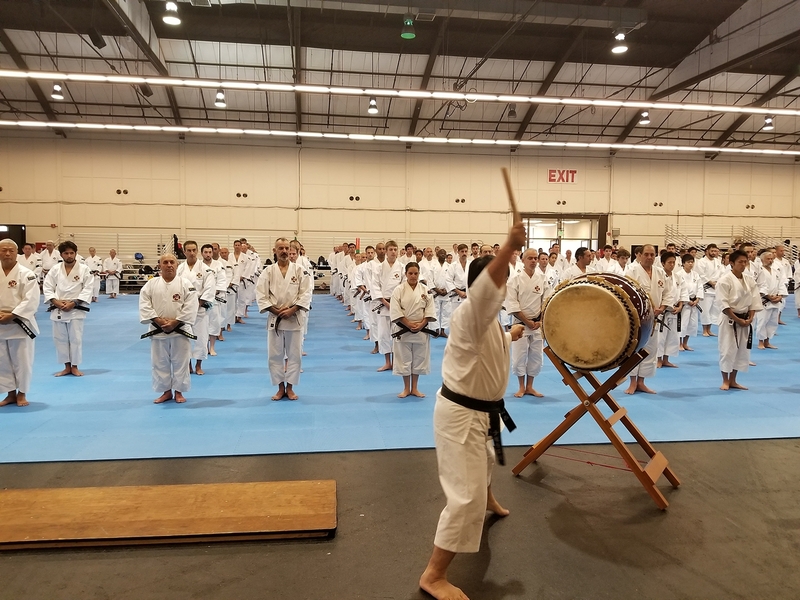 The Taikai came to a swift end with a closing ceremony and a comical closing speech from Hiroshi Aosaka sensei, where he told tales of his adventures in France as a young instructor and topped all this by singing to the seated kenshi. A great closing. This anniversary edition of the 2017 Shorinji Kempo certainly lived up to the values that founder Doshin So would be proud of. 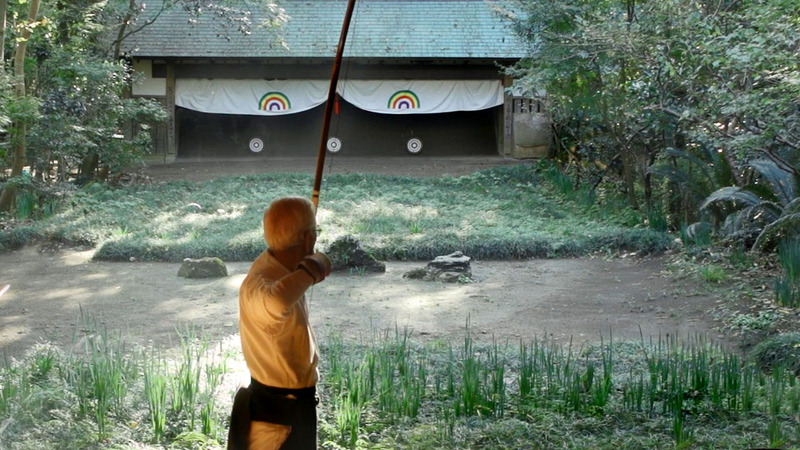 While we have visited the Hombu headquarters in Japan, Empty Mind Films could be considered outsiders filming the Taikai, but not once did we actually feel like an outsider. We were greeted warmly with ‘Gassho-rei’ by everyone we met from every level and made to feel like family. By the final day we were sad to see everyone leave, having made such good friends. And is’nt that what the founder envisioned… to meet strangers from all corners of the planet and become friends and family. Gassho!